The final weekend of the 2018 legislative session was a flurry of activity. We've broken down what got done, what didn't and what it all means below. They got it done. Legislators managed to pass a tax cut and conformity bill before the deadline that both lowers income tax rates for the first two brackets while also de-linking Minnesota's tax code from the federal system. The bill would also allow the state to set its own deductions and exemptions after the massive federal tax overhaul passed late last year. What it means: Conforming the federal tax code was high on lawmakers' to-do list this session because not conforming will mean complicated tax forms next year and possible increases for some Minnesotans. What's next:There's one problem: The bill is heading to Dayton's desk, but he said he's likely to veto the bill. Dayton said the proposal doesn't do enough for middle-class Minnesotans and excludes enough new money for school districts facing layoffs. They didn't get it done. The Legislature debated all session whether to charge pharmaceutical companies, manufacturers and distributors some kind of fee to help pay for opioid treatment and overdose prevention measures, but in the last minute, legislators substituted the fee with state dollars for efforts. 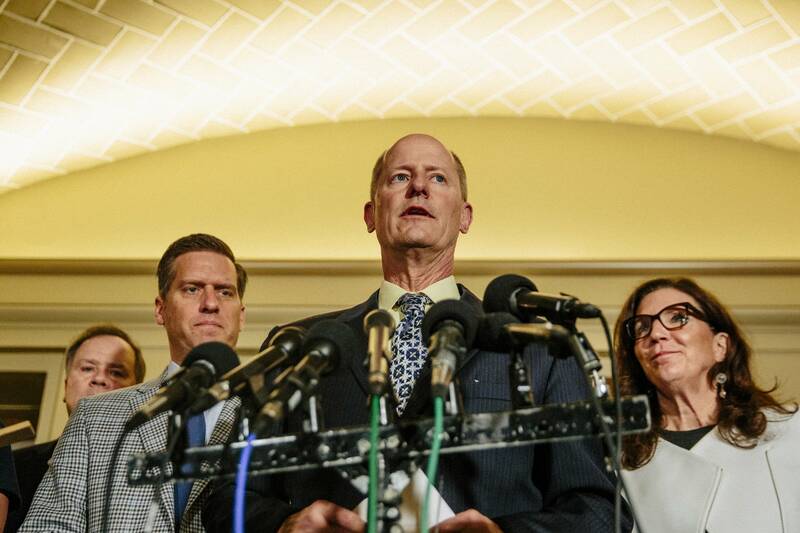 What it means: Legislators who pushed for an opioid fee were discouraged by the intense lobbying effort against the measure, but they want to pick up the effort again next session. What's next: The state funds for opioid treatment and prevention were included in larger budget bill on its way to Dayton, but he's said he will veto it in its current form. They didn't get it done. After a bipartisan push early in session, some conservative members of the House and Senate opposed making Minnesota the 17th state to require drivers to use their devices in hands-free mode. What it means: While the hands-free effort failed, it did inspire legislators to increase fines for people caught texting and driving. The first offense will mean a $150 fine, up from $50. Second and third offense fines will go up as well. What's next: Again, however, the increased penalties were wrapped inside a larger budget bill that Dayton said he will veto. They did get it done. Dayton wanted $138 million in new funds for schools facing layoffs, but instead, legislators sent him a $225 million package that included $50 million in new funding from school trust land payments and other existing dollars reserved for community education and staff development. What it means: If passed, 59 school districts facing layoffs and other cuts could preserve some of those positions. What's next: The funding is attached to the tax bill, which for now, Dayton has said he'll veto. They didn't get it done. DFL lawmakers attempted to force action on a handful of gun restriction bills, including expanded background checks and so-called "red flag" protective orders, but ultimately no bills made it to a full vote. What it means: Gun proposals are a perennial issue at the Capitol and will be back next year, especially in the wake of several recent, high-profile school shootings. What's next: Proponents of tougher gun restriction have promised to head to the campaign trail to vote for supportive candidates, but gun owners will also be out supporting pro-2nd Amendment candidates. They did it. Legislators included $28 million for school safety in the bonding bill and $25 million in the budget bill, and new school funding could also be used for school safety. What it means: After several high profile shootings, legislators say the money will give school districts the flexibility to add things like security cameras, resource officers and mental health services. What's next: The funding will only survive if Dayton signs the tax, budget and bonding bills sent his way. He has said he won't sign the budget or tax bill, but he hasn't said what he'll do with the bonding bill. They did some of it. In the past, legislation related to the environment has been part of the final give-and-take of the session. And this year was no different. Republicans who control the Legislature decided to wrap many major environmental policy and spending initiatives into one, big omnibus spending bill. Among the issues wrapped into the bill were those governing cost recovery for Xcel Energy's nuclear plants, a tax credit for buffer zones in farm fields and guidelines on the state's $720 million settlement with 3M. Legislation governing road salt didn't make it into that final spending bill. Legislators also sent to Gov. Dayton an amended version of the bills focused on the state rule aimed at regulating sulfate levels in waters where wild rice grows. Dayton vetoed a bill that would ease the approval of oil pipelines. A bill around pumping water from White Bear Lake became law without the governor's signature. What's next: The legislation wrapped up into the omnibus spending bill is still in limbo. Dayton has two weeks from the time he gets the bills passed in the final days of the session to decide whether to sign or veto. They did it. In the final hours of session, legislators passed a package of construction projects in the bonding bill that includes $825 million in general obligation bonds and money from a slew of other funds that totals $1.5 billion in projects. That includes local projects like the money to design the new Stone Arch Bridge and funds to build a new visitor center at historic Fort Snelling. What it means: Construction crews will get to work on college campuses, state parks and in local communities across the state. What's next: Dayton hasn't promised to sign the bonding bill, but it got support from both Democrats and Republican in the Legislature. They did it. It only took three tries, but legislators passed an 11th-hour proposal to shore up the state's ballooning liabilities in state worker retirement plans. The new deal requires the state and employees to chip in a bit more to the plans. What it means: The fix will help reduce the state's liabilities, but it will come with a cost to the state in this year's budget and the next. What's next: The fix will cut the state's $17 billion pension liabilities, but only by about half. Expect legislators to keep chipping away at the issue. They did some of it, but not all of it. The House passed changes to their own internal policies, which were sought after allegations against two sitting legislators exposed flaws in the Legislature's sexual harassment procedures. But an attempt to make a broader change to the so-called "severe or pervasive" legal standard failed in the final days of session. What it means: The legal standard has been narrowly interpreted by judges for decades, barring most sexual harassment cases from ever seeing their day in court. That will continue. What's next: Lawmakers say the standard needs to be vetted more in committees next session. They did or did not address it, depending on who you ask. Republicans included some provisions in the broader budget, but Democrats say it fails to include new licensure for assisted living facilities and doesn't include new legal options for family members to protect vulnerable adults. What it means: After a detailed series in the Star Tribune chronicling abuses occurring in elder care facilities, legislators in both parties say they want to make changes to the state's elder care system and industry. What's next: The few elder care provisions that survived the session were included in the budget bill, which Dayton has said he will veto. They (mostly) didn't do it. Earlier in session, Dayton and leaders agreed to $9 million in emergency funding for fixes to the botched licensing and registration renewal system, but more money was sought for both the system and the deputy registrars most impacted by the delays. Dayton vetoed funding for the registrars because legislators didn't send more money for the computer system. What does it mean: MNLARS is still experiencing problems, and without more funding, those are likely to persist. Some deputy registrar offices could also shut down. What's next: Legislators did manage to put some more money for deputy registrars in a broader budget bill, but Dayton has said he will veto the proposal. They didn't do it. Legislators sent Dayton a proposal to move it from a misdemeanor to a gross misdemeanor to block a highway during a protest. After leaving the door opening to signing the bill all session, Dayton ultimately vetoed it. What does it mean: The effort is dead, for now. What's next: Republicans could try and push the proposal again next session, with a new governor. 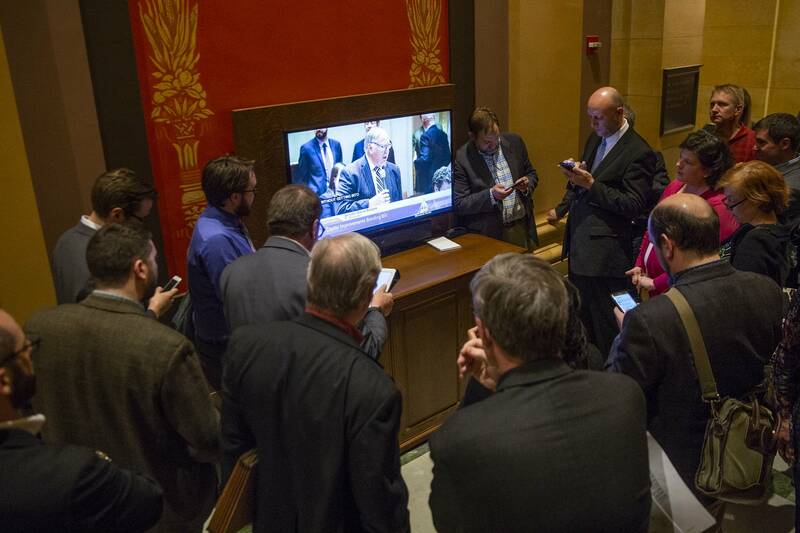 House and Senate leaders spoke with MPR News' Mike Mulcahy about the end of the session. At the beginning of the program Mulcahy was joined by House Minority Leader Melissa Hortman and Senate Minority Leader Tom Bakk. Speaker of the House Kurt Daudt and Senate Majority Leader Paul Gazelka closed the show.